East Haven celebrates its win over Career Magnet in Class M Girls Basketball Championship action at Mohegan Sun Arena in Montville, Conn., on Saturday Mar. 17, 2018. 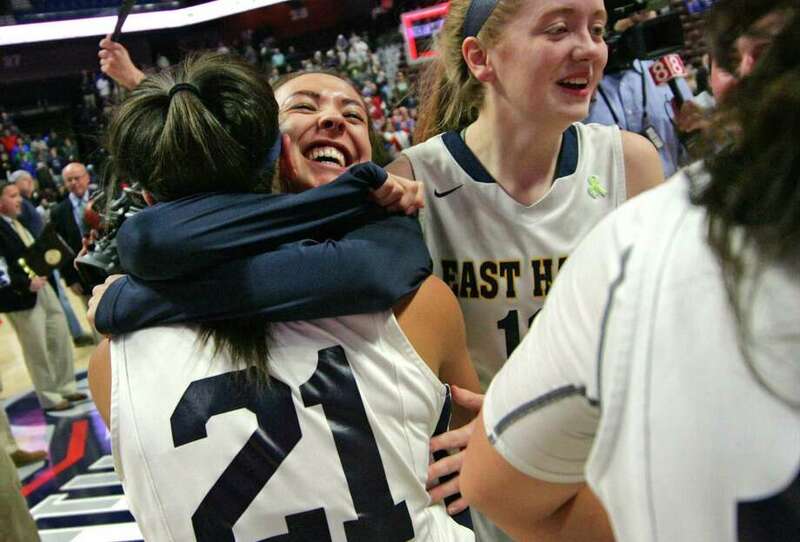 UNCASVILLE — Two times earlier this season, East Haven figured out a way to top Career. The third time the teams met did not look as if it would go the way of the Yellowjackets. Then, the group of Kylie Schlottman, MaKenzie Helms, Olivia Coyle and Isabella Ragaini took over. Battling back from eight points down with 3 minutes, 10 seconds to go in regulation, Ragaini capped a vintage comeback, draining a bucket from six feet out as time expired to cap a wild 49-47 East Haven victory in the Class M final at the Mohegan Sun Arena in Uncasville on Saturday. The title for the Yellowjackets was the first in the program’s history and caps a season in which East Haven finished 24-3. Trailing by six points after Helms drained a pair of 3-pointers, East Haven got within three at 45-42 on a 3-pointer by Helms. With the pressure on the Panthers, the game turned in an instant when Coyle converted a steal into a layup to cut the Career lead to 45-44 with 2:15 to go in the fourth quarter. The Yellowjackets used a 10-0 run, which ended with a pair of free throws by Schlottman, and another by Ragaini for a 47-45 East Haven lead with less than a minute to go. Career would not go away and evened the game when Carmen Rosemond drained a shot with 14.8 seconds left in regulation. The rest was up to Ragaini. Coming off a set play, Helms’ shot hit the rim and was tipped back by Schlottman. With a perfect read off the wing, Ragaini raced in and grabbed the rebound untouched, before draining the winner as time expired. For three quarters, the Panthers (17-10) did their best to contain Schlottman and Helms, holding Helms to just five points and Schlottman to 14 with a variety of defensive looks. During that time, Career used an 8-0 run, led by a 3-pointer by Yariliz Santiago, for a 25-19 lead. When Ciara Little connected in the final seconds of the quarter, Career led 35-26 with eight minutes to play. Both teams struggled from the floor in the first half and only managed 35 combined points. The Panthers shot just 13 percent (2-of-16), while East Haven was just a bit better at 25 percent (3-of-12). For the Yellowjackets, it was the play of Ragaini early as she scored three points in the opening quarter, but more importantly drew three Career fouls early. With Ragaini doing the work inside in the opening quarter, Schlottman scored the final four points for a 9-6 East Haven lead after eight minutes of play. East Haven had the biggest lead of the first half, twice taking leads of five points, at 11-6 on a bucket by Schlottman and 13-8 on Schlottman’s two free throws. The Panthers quickly washed that deficit away, going on a 9-2 run. Kayla Franklin opened the run with a bucket, and Rosemond connected for the final four points to give Career a 17-15 advantage with 2:31 left in the opening half. East Haven capped the second quarter on a run of its own, scoring the final three points for an 18-17 lead after Schlottman evened the game with a bucket and Coyle gave her team the lead with a free throw late in the half. Schlottman led all scorers with 20 points, and added seven rebounds. Helms had 17 points and seven boards, while Ragaini finished with six points and four rebounds. Rosemond led Career with 13 points, four rebounds, and four steals, while Santiago had 11 points and Hargrove 10 points and seven rebounds. Congrats to EH. What a fantastic game. Shout out to Career. They fought to the end. Congratulations East Haven.big win tonigjt.!! The girls fought till the end. I also would like to congratulate Career for giving us a good game. I want to tip my hat of to Rosemond and her toughness ,. A young lady that doesn’t get the recognition she deserves.. But once again we’ll have Helms and Rags both a year older… along with the freshman big who Russell actually threw into the game at one point. First, I wasn’t at Mohegan, so I’m going off just the Twitter feed comments and cell phone videos. Second, full disclosure: I was rooting for Career as the underdog. Sounds like Career, with 9 point lead at end of 3rd quarter, played the 4th not to lose rather than to win. That NEVER works. Always backfires. As the ‘dog with the lead, Career should’ve gone for broke. Aggressive at both ends. Lean forward. In first 3 quarters, they doubled Helms and forced ball out of her hands. Good strategy. (EH only had 26 pts after 3!) Helms is best playmaker on the court. Limit her, win the game. But in the videos of Helms hitting 2 threes in the 4th Q, she gets clean looks — no contest. Those are big time shots, and all credit to her for knocking them down. But she should NEVER have gotten clean looks. Should’ve been doubled every time she touched ball…doubled on every high pick and roll…and chased off the 3 point line at all costs. Make her go to the hole. Make her give up the ball. Force someone else on EH to beat you. “Anyone but Helms” should’ve been the mantra. As far as I can tell, Hargrove had no real impact in the 4th Q, and certainly no impact in the last 3 minutes. Which I don’t get. Most dynamic player on Career. So hard to defend. So good at attacking off the dribble. Was she being doubled? Why wasn’t she a factor in crunch time? Bottom line: 3 out of Career’s last 4 possessions ended in turnovers (steal / travelling violation / backcourt violation). Can’t win a state championship if you come unglued with the game on the line. If EH hadn’t hit the buzzer beater, no way Career was going to win in OT. They were reeling. EH had all the momentum and mojo. Yes you are mostly correct but I don’t think Career necessarily played not to lose. Career could not handle the EH press. EH should have started to press earlier. Both teams started the game missing very make able shots. Great game for the fans. Large EH crowd. Very impressive. Tom you really are a piece of work. If nothing else you are consistent. Troll. Career controlled the majority of the game. I believe their main concern was trying to limit Schlottman’s touches and keeping her off the offensive glass. I think I counted 3 second chance baskets for her. Overall they were successful in what I perceived as their approach. Bethke only has a 6 player rotation and they left it on the floor. Tough loss for Career as they put a great run together to reach the final. Same blueprint for EH in these big games. Schlottman carried them for 3 quarters and Helms took over in the fourth. Bill, with the comments you make I sometimes wonder how the heck you even can figure out how to get on here. If I were you before making meaningless comments at least have someone proof them, or did you just come home from spring shopping at Kohls? The comment you made in the other article is another gem – here in case you forgot “Carear should of one that state game”. P.S. Career was 0-3 against EH this year (they have to blow them out once in order to “blow them out again”) Thanks for making us all laugh, but nobody can take you serious with the content in what I think are supposed to be sentences. At the end of the day, East Haven beat a 20th ranked team by 2 points. They have only been challenged by 2 teams this tournament in the semifinals and the finals. Sometimes kids get nervous when they are in new situations. Both EH and Career struggled in the first half with shots and Career made some bad turnovers down the stretch. How is that the Career coach’s fault? Why don’t you give the coach credit for a good all around game and season with no D1 talent? Oh by the way, I remember that “school yard” team taking down Mercy as well. Regardless of your negativity and obvious hatred for the Career coach, good job to both EH and Career for getting to the Sun despite all the haters out there. Also good job to all the other teams that made the finals. A great accomplishment by a great group of coaches that know how to lead a team. Honestly, if you’ve never led a team to a championship game, you shouldn’t comment on things you don’t know. Just be a Fan! Everyone seriously needs to relax with this stuff, agreed. Jeez. Again, SCC Fan, you have no idea what was said in the huddle. Has it occurred to you that a coach with as much experience as the Career coach as well as many others probably, most likely told his players to burn some clock? The fact that you would think an experienced coach wouldn’t have had his players ready for a press is laughably. I’ve seen Career play many times, and they usually break any press thrown at them. Especially when teams are trying to impose their size. I don’t know why you can’t accept that those girls were showing their nerves because they were in a big spot. Maybe the girls thought they could be heros with the three ball. They actually had been shooting the 3 ball better this year than previous years. As far as your Kohl’s comment, I love that people like you think that it’s so easy to coach anywhere, with or without talent. Those are truly the people that know nothing about coaching! Stay a Fan! Listen, the bottom line is East Haven got the absolute most they could have out of a team with two good players. Coyle got hurt and that was a huge loss for them, with her they would have been a very different team. They had Shlotman, who gives you the most you can every time she is on the court and works extremely hard. She is strictly a low post player and since no teams had a chance in M, she didn’t have to face any size, which is why EH would have gotten killed in class L or LL. Helms has a lot of talent on the offensive end but was not consistent. Outside of those two EH didn’t have a player that would have started on most other teams, including Career, Mercy or Hand. Both Rocky Hill and Career should have beaten them, they simply played poorly down the stretch and part of that was that East Haven was relentless in there desire to win, but another part was lack of execution. Not East Haven’s fault that they have gotten so much attention, they are the heart of the SCC and gametime coverage and the referees and everything else associated with girls basketball in Southern Connecticut and haven’t won in a long-time, so many were rooting for them. Just the way it is. EH beat Career 3 times. First time by 30 points on Careers home floor. Last time i checked games are 32 minutes long. You need to play them all. Does not matter what the half time or third quarter score is. Career and Rocky Hill played poorly down the stretch. Why? Because EH pressed them and made them play poorly. It is amazing why some of you guys just can not give EH the credit they deserve. Who cares if they don’t go anywhere next year, they won the state championship on a last second shot THIS YEAR! Did your team win? So Tom are you confident Mercy repeats with all the players they lose?? You just can’t bring yourself to give East Haven any credit. You act like a 5 year old. Spot on A real hand tiger. Thank you. I do not get why some on here have to bash high school kids. Thanks Scc Fan, kohl would of beat them by 30,there’s no comparing the two coaches, he’s already on to next year. Tom, the analysis you provide is amazing!! Keep up the good work!! Last time I checked Bethke has won more titles than kohs!! Amazed that they even let you post the nonsense you do on this site!!! Easy to be on to next year when you get kids from multiple towns, Thomas. I must agree the coach did not know how to bring it home.As a spectator sitting close to the bench I heard him take off the press and go zone,(on a shooting team really?) I also heard his assistant coaches tell him to spread the court and play keep away. (you are up by eight with , let them foul the girls you are in the bonus) apparently he doesn’t listen to them and he got out coached. Its terrible for the girls they fought hard !! They need a better coach! !